The ce ntral coastal province of Binh Thuan recorded a drastic increase in the number of holiday-makers to local tourism sites during the National Reunification Day and May Day holidays that began on April 30th. The province’s tourism sector estimated that about 70,000 domestic and foreign tourists arrived in the locality from April 30 to May 3, representing a year-on-year rise of 13 percent. Inspections of businesses operating in tourism have been intensified to control the prices of tourism services, especially room rentals. Binh Thuan is becoming an attractive tourist attraction for both domestic and international tourists, especially those from Russia, China, Germany and the Republic of Korea. 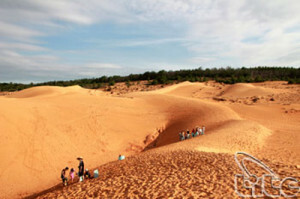 Viet Nam’s popular tourism spots have been swamped by visitors during the five-day holiday as sunny weather helped lift the number of vacationers by 20 percent compared to the same period last year.